ABS held its 157th Annual Meeting on Tuesday, detailing the organization's performance and future focus to its members. "In 2018, we delivered solid, top-tier performance. 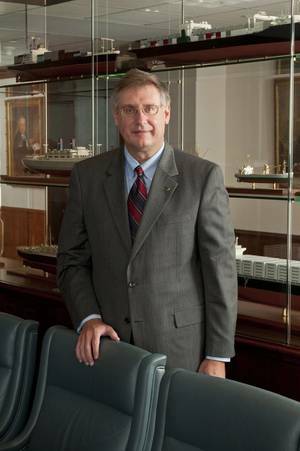 We maintained leading positions with owners and builders, held our 70-year-strong top position in the offshore market, and led the industry for safety, port state control, and the global orderbook to grow our classed fleet to 260MT," said ABS Chairman, President and CEO Christopher J. Wiernicki. "Rapid change and complex challenges characterize our maritime world today. The greatest challenge raised by the fourth industrial revolution lies not in realizing digital transformation, but in navigating the complexities of digitizing our industry to enable, and ultimately achieve, industry sustainability safely," said Wiernicki. "Success in this environment requires a strong position on multiple fronts and the vision and commitment to lead an industry transformation. This requires a solid foundation, resident expertise, and the ambition to navigate the uncertainties and instabilities that are the new norm in the maritime industry-and to emerge from uncertain times better, stronger and smarter, as an enterprise that continues to post positive performance across the board. I am very proud to say that this is ABS." Wiernicki said: "Leading class into the future was never more evident for ABS than during 2018 as we continued our investments in people, information systems and technology, to strengthen our leadership in the industry's digital transformation to ultimately enable sustainability." United States Coast Guard Commandant Admiral Karl Schultz addressed the ABS membership, "As our Marine Transportation System continues to grow in capacity and complexity, third party organizations such as ABS, with proper oversight from the Coast Guard, allow our Nation's maritime industry to evolve and keep pace with those increasing demands. The Coast Guard is incredibly appreciative of its continued relationship with ABS. Together we will continue to make our Nation's waterways safer to improve our Nation's economic prosperity."